Note: Some customers see a "Something went wrong" error message when they try to sign in with Safari on Mac. Read more at Fixes or workarounds for recent issues on Outlook.com. 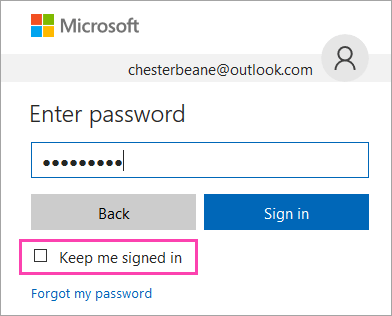 If you're having trouble signing in to your Microsoft account, there could be a few different reasons for that - like you can't remember your password or have two-step verification turned on. Your account hasn't been inactive for more than 365 days. To keep your Outlook.com account active, you must sign in to the account at least once every 365 days. After 365 days of inactivity, your email will be deleted and cannot be recovered. Reset your password. If you've recently changed your password, try entering your old one again. If your old password works, you must lock your device and then unlock it using your new password. If you're having problems with Outlook.com, check the service status. If the status isn't green, wait until the service is running normally and try again. If you've forgotten or lost your password, you can create a new one. Choose the reason you can't sign in, and select Next. Note: If you don't have or can't get to your security info (your alternate phone number or email address), click I didn’t get a code when you’re prompted for a code at sign-in, or I don’t have access to these when you’re resetting your password, then follow the instructions. Your account might be temporarily blocked because we noticed some unusual sign-in activity. If your account is blocked, see Unblock my Outlook.com account. Microsoft always keeps an eye out for unusual sign-in activity, just in case someone else is trying to get into your account. If you're travelling to a new place or using a new device, we might ask you to confirm that it really is you. Read How to access Outlook.com when traveling for more information. Can't sign out of Outlook.com? If Outlook.com automatically signs you in, turn off automatic sign in. In Outlook.com, select your account picture at the top of the screen. On the Enter password page, clear Keep me signed in. If you're still having problems with signing in, read When you can't sign in to your Microsoft account.